I have been such a delinquent blogger lately. Things continue to be busy in our home. Last weekend, I had the world’s worst tummy bug. I didn’t even get sick like that while I was pregnant. Allen was very sweet and took great care of Nathaniel and me. I am pretty sure that Nathaniel missed at least one meal that day. I guess I need to make a basic schedule for him to keep in the house, just in case something like this happens again. Allen tends to rely on me for all kinds of schedule keeping. This past week I also learned a bit of what it is like to be on my own with Nathaniel. Allen had a radioactive iodine scan to see how well the radiation treatment he had last July worked. This is part of the follow up after having the thyroid tumor removed in 2005. It is no big deal for him, but it means he can’t hang out with us (especially Nathaniel and the kitties) for a couple of days. It reaffirmed how much I appreciate what a wonderful husband and father Allen is. I also realized how much Nathaniel really LOVES his daddy. When Allen got home, Nathaniel would light up and then get upset when Allen wouldn’t hang out with us. They are two peas in a pod. I am more and more in trouble every day. This weekend Allen’s dad and his fiancee came to visit us. We had a nice weekend despite the heat and losing power for the second time this week. 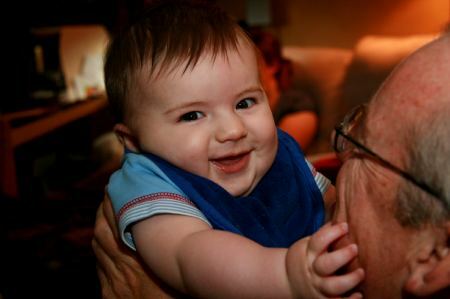 Nathaniel had fun with Granddad and I got some good stitching done. I am now about 3/4 done with the baby sampler. I plan on finishing it up and then working on Wendy’s Neighborhood RR. I should have both done by the end of the month:) YEAH!! Nathaniel is looking gorgeous!! And so is his birth sampler! 6 months have whizzed by! 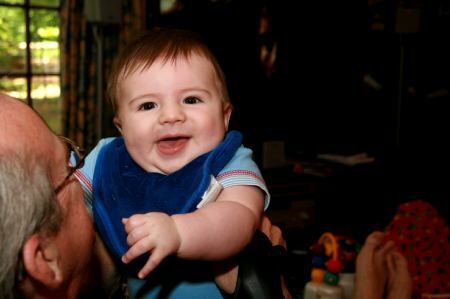 Wow, six months old already. Where does the time go? The birth sampler is looking great. 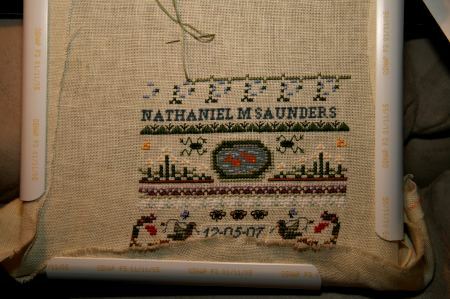 Lovely progress on the birth sampler and great pics of Nathaniel! Leslie, I’ve never seen Allen, but from what I can see, Nathaniel looks just like you! I hope Allen gets great results! Your baby sampler looks awesome. Did your daylily bloom yet? What a wee darling he is. : ) I’m looking forward to seeing more progress on his birth sampler, it’s looking fantastic. I stitched this for my best friends new baby last year and loved every minute of it. Sorry to hear you were sick, but the birth sampler is coming along well. It is beautiful, and so is Nathaniel!